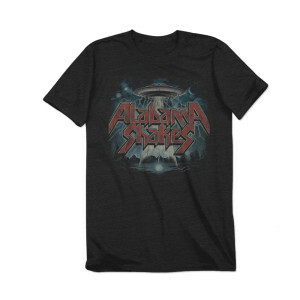 A vintage print UFO design on a vintage black 100% cotton soft tee. Resolved an issue with order swiftly with the right size! Great shirt! This shirt is soft, the design is rad, and it's a relaxed fit that is true to size. I recommend it. Got this shirt and wore it the next day. Fits perfectly and looks just like the picture! Very soft and awesome shirt. The graphic is definitely a lot brighter and looks a lot lot less worn in then shown in the picture but, that's not something a few good washings and some time in the sun won't fix. It's overall a GREAT shirt that feels good quality. Fits very true to size. I'm 5' 6" and about 115 and a medium fit perfectly baggy just as I would expect from a medium. The shirt itself is a tad long but it was meant for guys so that's what I would expect. It doesn't feel like cheap band merch. You get your moneys worth with this one and the company was very helpful and considerate and even resent my shirt when the first one got lost in the mail.